Directed and narrated by Patricio Guzman, Chile, Obstinate Memory is a documentary film in which Guzman returns from exile to Chile to screen his trilogy of documentaries in The Battle of Chile for the first time in his home country while reflecting on what Chile has become. The film is a reflective look at a man returning home as he also talks to those who lived in the time when the country was under the rule of Augusto Pinochet. The result is a somber and evocative film from Patricio Guzman. Returning to his home country nearly twenty-three years living in exile where only a few of his relatives have survived, the film has Patricio Guzman follow several individuals who were part of the Unidad Popular party, Salvador Allende’s personnel, and individuals who try to look back at the events of September 11, 1973 when a coup d’etat emerged and overthrew Allende in favor of a darker regime. The film has Guzman not only reflecting on that period when he made his trilogy of documentaries but also coming back to a country that is trying to suppress memories of those times as well as the rule of Augusto Pinochet following its coup which ended in 1988 following a referendum. With the help of cinematographers Eric Pittard and Paolo Saura, Guzman would have the camera all over Santiago, Chile including a sequence at the Presidential palace where Guzman have one of Allende’s former guards in the place pretending to be a crew member holding a tripod. Interviewing bodyguards and Allende’s chambermaid at the palace, they all talk about what happened on that day of the coup as it would also include discussions about Unidad Popular and why it fell apart. Even as students debate over what it succeeded to do but also what it failed to do as some of them are conservative but not in an extreme way. Guzman would also feature some archival TV interview from Allende’s widow Hortensia Bussi who had to wait 17 years for her husband to receive a proper funeral that she could attend while still waiting for personal effects including photo albums to return to her. Guzman also touched on the disappearance of many people in the aftermath of the coup where many of Allende’s supporters were never seen again including members of Guzman’s own family as well as Jorge Muller Silva who was the cinematographer in Guzman’s trilogy of documentaries. With help of editor Helene Girard in showcasing footage from his documentaries as well as a news footage and photos of the events of the coup, Guzman also showcase things in which some of the survivors of torture camps and such would look into. Even filmmakers and professors would talk about what happened where the film would culminate with private screenings of the trilogy of documentaries in four universities in Chile since public screening for the films is something that couldn’t be done then due to distributors’ fear of upsetting the people of Chile. 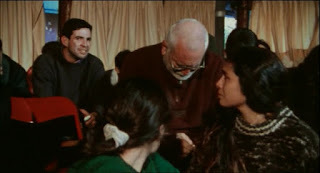 Especially as Guzman would use sounds of the events with the aid of sound editor Leopoldo Gutierrez as the aftermath of the screening is quite devastating considering that a generation of kids who hadn‘t known much about the events of the coup are forced to face the reality of what happened. The film’s music by Robert Marcel Lepage is low-key as it play into traditional woodwind music of Chile yet its soundtrack is largely dominated by a performance of Moonlight Sonata by Ludwig Van Beethoven that is performed by Guzman’s uncle who also talks about what happens as he’s one of the few relatives who had survived the awful events during Pinochet’s reign of terror. Chile, Obstinate Memory is an incredible film from Patricio Guzman. It’s not just this very personal and engrossing film about a man returning home to his home country but also reflect on the events that shaped his country and allow a group of people to see the documentaries he made about those events. In the end, Chile, Obstinate Memory is a phenomenal film from Patricio Guzman.